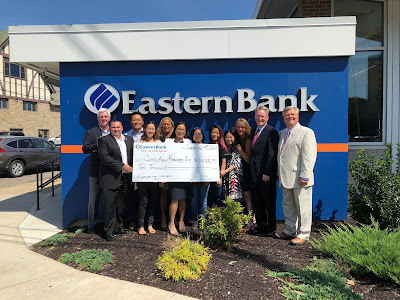 Quincy, MA, September 5, 2018 – Quincy Asian Resources, Inc. (QARI), a non-profit that provides services to the Asian population in Boston and surrounding South Shore areas, today announced it has received a $10,000 Targeted Grant from Eastern Bank, America’s oldest and largest mutual bank. The grant will support empowerment of Asian females in the Youth ServiceCorps, a youth engagement program that engages over 300 Quincy students to be leaders by developing and executing service learning projects in the Quincy community. Each year, the Eastern Bank Charitable Foundation’s Targeted Grant program supports hundreds of community-based organizations working for progress on a specific issue in Eastern’s New England footprint. In 2018, in celebration of the Bank’s 200th anniversary and to honor its first depositor, Rebecca Sutton, Targeted Grants have been designated to support organizations addressing a range of issues that disproportionately impact women, such as sexual assault, domestic violence, human trafficking, health care, pay equity, and senior management and board representation. QARI is among 170 nonprofits each receiving a $10,000 grant. In total, Eastern is granting $1.7 million in Targeted Grants this year to nonprofits in communities from New Hampshire to Cape Cod and throughout the South Shore, North Shore, Metro West, Merrimack Valley and Greater Boston. · A woman is assaulted every nine seconds in the U.S. and one in three women has been a victim of physical brutality by an intimate partner, making intimate partner violence the single greatest cause of injury to women. · In Massachusetts, women earn 83 cents for every dollar paid to men. In New Hampshire, they earn 76 cents. African-American women nationwide earn 64 cents for every dollar earned by white men, and Latinas—only 56 cents. · In the sciences, women represent less than 25% of those employed in computer and mathematical occupations and only 15% in architecture and engineering. For women of color, this gap is even wider. Asian women, African-American women, and Latinas make up less than 10% of working scientists and engineers in the U.S.
· Women receive more graduate degrees and they hold more faculty positions in colleges and universities, and yet, men hold the highest number of tenured university positions. · Only 32 women run Fortune 500 companies and only two are women of color. Less than 20% of all board seats in Fortune 1,000 companies are held by women. For a complete list of the 2018 Targeted Grant recipients, click here.